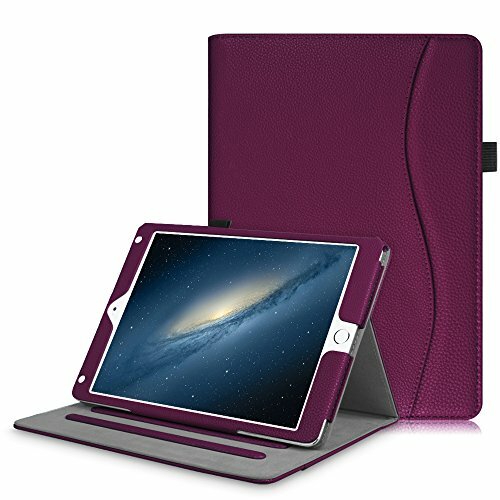 Fintie iPad 9.7 2018 2017 / iPad Air 2 / iPad Air Case - [Corner Protection] Multi-Angle Viewing Folio Cover w/Pocket, Auto Wake/Sleep for Apple iPad 6th / 5th Gen, iPad Air 1/2, Purple | Replicafer Co. This case is designed for the New iPad 9.7 2018 6th Gen, iPad 9.7 2017 5th Gen, iPad Air 2, iPad Air 1 ONLY; Will not be compatible with iPad Pro 9.7 Inch 2016 Release, iPad Pro 12.9 Inch 2015 Release Tablet, the original iPad, iPad 2,3,4 or iPad mini. This case allows you to adjust the iPad to multiple angles securely. Document Card Pocket is designed for you to store your business cards, bank cards, notes or bills while on the go. Built from durable PU (synthetic) leather exterior and soft microfiber interior - Snug fit, lightweight and protective.